Some TV characters don’t change, and that’s the point. Tony Soprano stubbornly remained the same across six seasons of “The Sopranos,’’ despite the best efforts of his therapist, despite glimmers of vulnerability and potential. Ditto Gregory House, who always seems on the verge of waking up from his nightmare of self-absorption and anger. We all know people like that, who run in place. Other characters do change profoundly over the years, though. 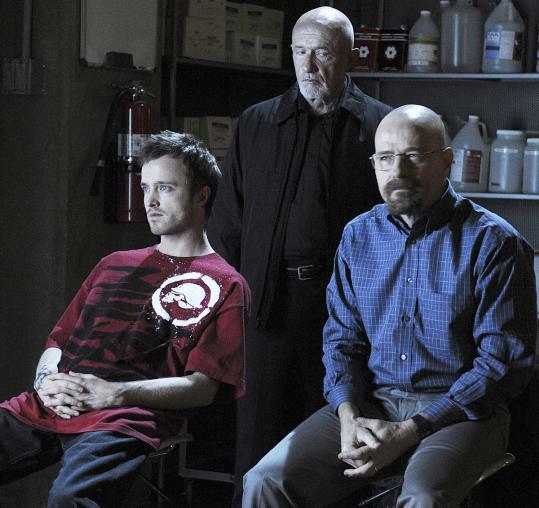 And Walter White and the other major characters on AMC’s “Breaking Bad’’ are among them, big-time. The phenomenally good series, which returns Sunday night at 10, has emerged as one of TV’s most striking portraits of personal transformation. In three seasons so far, Walt has traveled from A to Y, with his wife, Skyler, his sous chef Jesse, and his in-laws following right behind him. In season 4, Z is looming in the close distance. Walt’s metamorphosis, of course, isn’t what we might have hoped for. While cancer has driven Laura Linney’s Cathy on “The Big C’’ to waste less time and embrace her family, it has led Walt to the dark side. Once a chemistry teacher and dutiful husband, he is now a full-on villain who kills in cold blood to protect his prestigious meth-cooking business. Looking into Walt’s shifty, calculating eyes in the tense season premiere, you can no longer see hints of his slavish former self. He has broken bad, and as Walt, Bryan Cranston has made that personality rupture remarkably credible. Season 4 promises to continue following Walt’s downward moral mobility, as he takes on Gus, the meticulous meth distributor played with icy excellence by Giancarlo Esposito. Skyler (Anna Gunn), too, is on her way down. Watch the way she uses her baby Sunday night, to get what she needs from a locksmith. Now that she knows about Walt’s meth business, she wants to be his business director, laundering his money by buying the car wash where Walt once worked. She’s not just a Carmela Soprano, enjoying the fruits of her husband’s nefarious labors; she is insinuating herself into his criminal life. And the writers have cleverly given her extra motivation, since her sister, Marie (Betsy Brandt), needs money to help with her disabled husband, Hank (Dean Norris). For me, the most complex transformation on “Breaking Bad’’ has been in Jesse, played so memorably by Aaron Paul. In next week’s episode, two of Jesse’s old party boys come to his house and the contrast is shocking. Not so long ago, Jesse was a blissfully ignorant and relatively innocent tweaker like them. Now, he is a troubled man who has loved and lost. He is weary, indifferent, beyond cynical. He doesn’t want to party; he just wants to lose himself. He has a robot vacuum cleaner that journeys randomly along the floors of his home like a lone flying saucer, a symbol of the black hole inside him. That creeping vacuum, and the way the camera eventually becomes it, are just a couple of the countless flourishes that make watching “Breaking Bad’’ an uncommonly full experience. It’s not just beautifully acted and written; it has a unique look and expertly hypnotic pacing. The show has a way of making you feel claustrophobic, particularly in the underground lab scenes - last season, for instance, when Walt was obsessed with a fly, or tonight, when a red liquid runs along the red floor. The lab evokes the feeling of being buried alive - especially since we know that an expansive Southwestern landscape is just above it. Dropping into the world of “Breaking Bad’’ is like finding yourself in a time warp, where everything moves slowly and deliberately - but never dully. Every moment counts, even a scene in which we see Marie cleaning out Hank’s portable toilet; it’s when we understand on an emotional level why the injured Hank feels so humiliated around his wife. Show creator Vince Gilligan and his crew are able to milk all the tension they create, never rushing into action or away from pain. A taut exercise in withheld disaster, “Breaking Bad’’ is riveting.